Lace - isn't there something about it that's simply delectable? It seems to chime perfectly with the feelings brought about by Spring. Maybe something to do with the frothy, romantic, fairy-like feel one achieves by wearing it in abundance? However today it is strictly woolly jumper weather, as we have had the first proper rain fall in weeks. 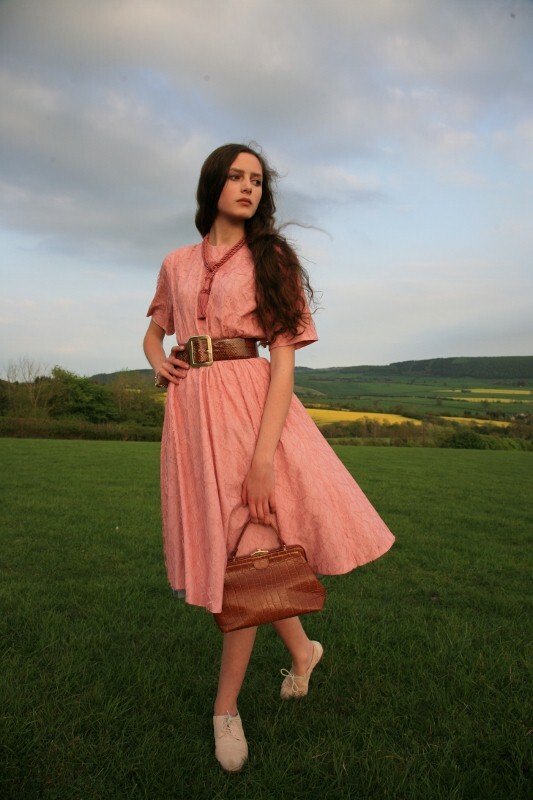 I bought this vintage pink dress a while ago, and it is one of those items that seems to languish rather forlornly on the edge of my wardrobe, waiting for the possibility of being taken out and worn - a little like a dancer who knows she is beautiful, but rarely gets chosen to accompany someone in a Waltz or Quickstep. Finally, it was its turn for 'a trip out' last weekend, when I wrestled it out of the clutches of the other cramped coathangers to create a Ballet Russes inspired look. I'm using the term 'inspired' quite loosely here, as I'm not sure if there is any tangible reference to Diaghilev's company among the pink lace and green velvet, but I did feel very dancer-like. Visiting the Ballet Russes V&A exhibition (early last Autumn) on the day I was told I was going to be having surgery was a magical (and somewhat surreal) experience. I have since pored over the book that not only details the history of the memorable company, but also provides very good quality pictures of the spectacular costumes. The vintage jacket in the first image was my mum's and the 'necklace' is a big curtain tassel I found hanging on the back of my door. The pink brogues are from Next (and still take the title of 'comfiest shoes I own'), and the vintage belt used to belong to my grandma. The bag is Russell & Bromley (found for £4!) and the necklace wound around my wrist is vintage. My hair was kept in place with a vintage silk scarf. Now talking of lace, I don't want to go down the whole writing-about-the-royal-wedding route (I hadn't planned on watching the coverage - but I must admit I couldn't help being drawn in), but ﻿some reference must be made to that dress. I was so pleased to see that it was designed by Sarah Burton for Alexander McQueen, and that it took inspiration from the eternally glamorous and graceful Grace Kelly. One elaborate detail that really stood out to me was the incredible amount of time taken to craft the lace that adorned the bodice and train. The fact that 'The needleworkers had to wash their hands every fifteen minutes' has been bandied around the blogosphere so many times it probably seems that I am now stating old news. Nevertheless, the time and effort that went into creating that garment is astonishing. This, along with the nominees for the Turner prize being announced today, sparked an idea for another debate. Aside from Royal Weddings and the hysteria-inducingly pricey couture and high fashion (which I do love), do we still value quality in the twenty first century? Arts such as lace-making and embroidery could be considered specialist skills, where once nearly every household in Britain had some basic knowledge. Obviously many of us have other things to do than sit around sewing, but is the craft of exquisite needlework even appreciated any more? I mention the Turner prize because I am frankly a little sick of the Damien Hirsts of this world. It seems that now anyone can have a conceptual idea about sticking some oranges to a canvas and calling it art, or in the Turner Prize case being nominated because your painting material of choice is make-up (I liked drawing in lipstick and eyeshadow when I was five - does that make me deserving of £25,000?) I know that this is just my opinion, and art is the biggest example of 'Beauty is in the Eye of the Beholder', but apart from the BP portrait prize, are there any major awards out there that recognize craftmanship and training over concept? All of the arts, be it fashion design, music, photography, sculpture or writing, need honing and training to achieve real skill. I appreciate reading books where the writer is capable of tight plotting or breath-taking images, and seeing photography exhibitions where the photographer has captured the soul or character of the subject in front of them, without needing to resort to Photoshop. However sometimes I worry I am among a dwindling number... How many artists today would undertake three or more years of training in Florence to master their technique? So now for the usual - what do you think? Are my views hopelessly out of date? Or does anyone out there feel the same? Edit: I realised the above might make it sound like I am only for 'Classical' paintings. This is not the case at all (although I am partial to a pre-Raphaelite) - instead what I am lamenting is the lack of skill and craft in various instances. But I do love the work of artists such as Rachel Whiteread - the first female winner of the Turner - who, among others, proves that modern art is an incredibly valid and innovative way of expression. Another artist who is creating extraordinary pieces is Ai Weiwei. But again, just my personal opinion. Gorgeous dress! I love the pink lace and the necklace. You look amazing in every colour you wear, but in this, it's just made for you!it's a pleasure for me to watch your great outfits and read your articles! chapeau bas! stunning. maybe it's because lace used to be hand made, either way, I totally agree, lace is amazing. Well, I think the point of art is expression, and that it's no better to insist the "quality" of the art be up to a more classical standard than it is to paint in make-up. Both are limiting. If you like a piece, then it's good. It truly is in the eye of the beholder, and the vision is in the eye of the artist. I think art should transcend the times and constantly evolve. 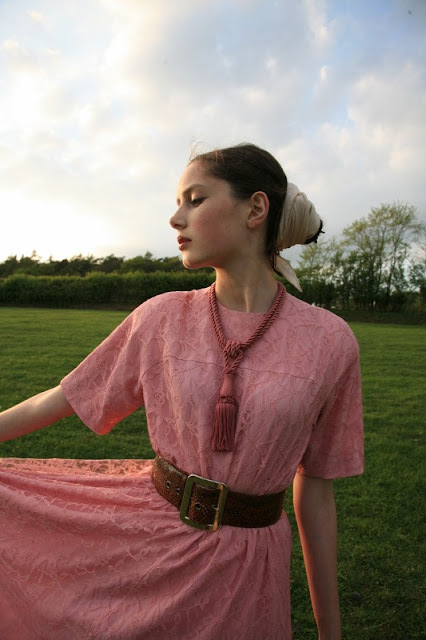 I love the tassel rope necklace! Now onto the heavier subject at hand. I'll admit that I've never heard of Damien Hirst before today, and with four AP exams this week I don't have time to read his entire biography, but it does appear that he studied at the Leeds College of Art and Design and at Goldsmiths, University of London. Sometimes I do see modern art and think to myself that I could have created such a piece. But if an artist sparks controversy, hasn't she been successful? A plain drawing of a flower vase, no matter how realistic and beautiful, will never be discussed or remembered. If someone chooses to draw with an unusual medium or stray from the norm, I definitely don't think that it means he/she is any less talented. Of course, I think artists should train and refine their technique. But can you look at an abstract expressionist piece and judge the painter's ability to draw? If you watch a ballet dancer, can you assume she cannot tango? If you read a magazine article about science, can the author not also write fiction? Art is not mutually exclusive. The final product does not necessarily reflect ALL of an artist's skills and training. Orange peels may have a deep, symbolic significance to the artist, but that doesn't mean that the only type of art he can produce involves fruit skins. There is a debate about what is "art", and I think that art is often a fluid concept. I believe, however, that any art, much like any emotion or opinion, should be respected and valued. Heartfelt art - art that is vulnerable and expressive - should *never* be quickly dismissed. I do love modern Art, I feel that is fresh. It takes creativity to come up with such absurd ideas, Damian Hurst's work is very much conceptual. I don't think you would come up with his ideas randomly, without thinking of a message to portray. Though don't get me wrong, I don't particularly enjoy Art that has a spot painted in the middle. One person who does it is fine, but it's not unique. That is the problem with modern art it doesn't have the same quality to it. Though people like Andy Warhol who brought around the mass way of producing Art, are still genius' in their own right. Sorry for all the blahhh blahhh! Lovely outfit as usual, loving the dress and the curtain tassel! i adore the green jacket! I do tend to agree Roz; for me it is a lamentable tragedy that art & craftsmanship seems to have fallen under the spell of quick and easy consumerism ~ much like most things these days. Personally I find myself far more drawn to classical/older art, vintage manufacturing, traditional practices; anything where there is considerable time and thought put into producing something that is beautiful and lasting ~ not just here today and gone tomorrow... Quality over quantity. Now that is not to say that today's artists do not put thought into their works. I myself use a DSLR and Photoshop for my studio photography ~ but that being said, I still am aiming for a sense of traditional timelessness in all of my pieces. So perhaps the challenge for today's artist is to find the balance between using modern techniques with a traditional depth of thought and feeling that I personally see lacking in today's art world. The color is gorgeous! So in love with it! YES!! amazing this is absolutely so elegantly photographed the style is to die 4 and i just love the model! once again great job!! So true. Majority of the people nowadays favor concept over quality and craftsmanship. I also feel the same as you do, but then art is all about personal expression and there are no rules that limits it. Art simply goes with the time and people. Photographers who use Photoshop are modern artists. I think we should appreciate them because their work is just as good as the work of photographers who don't resort to Photoshop. Oh absolutely beautiful, Roz! Sending this quickly as just did another post of you ('homage') and will write more later - and properly read this, I'm just skimming thru. You know Mr. Dot: soon as he's back - any minute - he's going to expect me to be ready to go swimming! Beautiful today my lovely - I love the pics with your hair twisted up in the vintage scarf and the dress is so very, very special. You are so lucky to have that little beauty hanging in your wardrobe to be taken out, admired and worn!! I actually think handicraft skills are more appreciated once again as they are so very rare these days - Etsy's inspired so many people to give it a try. I have seen a few people using curtain tassels creatively lately, and this gives me even more ideas. The broderie anglaise style and tassel detail on the dress is beautiful, and the blazer is such a rich and lovely color on you! Such a dreamy, spring look. I absolutely love the fact that you've used a curtain tassel as a necklace, so original! And the perfect colour too! ooh i love this green and pink togrther !! and the necklace is so nice, did you find it like that or di you made from a real one ???? My goodness, you are stunning! That last picture is especially beautiful. I am in love with the pink/green color combination. You pull it off without looking like a watermelon or something. I feel that due to our advancements in modern society we tend to forget all of our achievements we made in the past without all of the technology we have today. As a results so many arts are being lost over time, like tatting. I suppose its similar to my fear of printed books dying out. Hm, perhaps I'm in the wrong century. Lovely photos! I love the green velvet. Just discovered your blog. Lovely images! The English backdrop is perfect. I love the combination of the pink and green together; this is a ver' lovely chic, classical look, honey. WOW!!! I've discovered your blog and I loved it! This outfit suits you perfectly! You're remarkably beautiful! :DDD Love everything! wow, great and very strong pictures! Oh! Thank you so MUCH for commenting! I tought that such a popular blogger wouldn't reply! I feel as I was ,, the choosen one" :). I just adore your dress! Has anyone of you friends from your city has a blog? If so, could you tell me? I've got second question - did you wore this outfit in school? I am in love with that dress. PINK LACE is gorgeous! As for the ballet russes inspiration... =) I think it was a great idea. I have been in ballet for fifteen or so years... and I am eighteen now. Since I could walk I have been dancing. It is my life. So I appreciate people who like ballet or mention good things about it! ALSO I ask the same question is needle work appreciated or even noticed!!!!! I went to a quilt exhibit in San Fransisco about a half year ago. Amish quilts all made by hand, equisite details and amazing patterns. I couldn't believe they had made them without technology! oh also. this pink is such a good colour on you! because your skin tone compliments it so well and visa versa ! Wow you have such a great style and outfit! Couldn't agree with you more about art and skill. I love pre-Rafaelites too. Beautiful pictures, love how you used green blazer in the first photo. such gorgeous photos. you have vintage perfected. I agree with you that not many people have knowledge in such traditions as lace making, quiliting etc very traditional techniques that should stay in our heritage. I for one was very pleased and so intrigued by the V&A exhbition about quilts, it taught of the way quilts were made. One piece of information I cherished was that If you looked inside the lining of a quilt you would find papers with literature form the day, old books with their pages ripped out for paper to form the template, which would teach a lot about the culture of the day. I learnt about many new artists embracing the techniques of quilt making and its importance. One of these being Tracey Emin who I believe s terribly underated and abashed by critiques who seem to have no knowledge of traditional technques. I like that through the work of Tracey Emin I have grown more interest in traditional techniques. I wish I had gone to the ballet russes exhbition, since I have been younger I have had a great interest in Ballet, luckily they release the books alongside the exhbition so I may have to indulge in a read of this as it sounds good. I mut say It is refereshing to see someone expressing their thoughts so thorougly, you blog is an interesting read & your photographs always remind me of the tumbling hills described in Wuthering Heights along with your slightly classical style.